Pentecom’s Erica Montgomery has been with the company almost a year now but the productivity and dedication she displays can be compared to a veteran employee. Montgomery is a Team Lead Assistant and works on various conversion projects in the office with duties including QC, delivery, parsing and anything else that is asked of her without hesitation. If you were to ask her coworkers to describe her, she’s quite certain they would use the words “hardworking” and “goofy”. Erica knows how to get the job done while having a good time doing it. However, given the opportunity to obtain a super power, Erica would choose “invisibility” so she could be places without others noticing (Pentecom would definitely miss seeing her smiling face in the office though, so we’re glad that’s not possible). Recently, Montgomery was selected as one of Aveeno’s top 21 naturally beautiful women throughout the nation. In March, Erica submitted a photo of herself with the #naturalbeauty. It wasn’t too long after that Aveeno contacted her and informed her that she was a possible finalist in the Aveeno/People Magazine contest. After going through all the rigorous background checks and paperwork, she was indeed selected as one of twenty runner-ups in the contest. 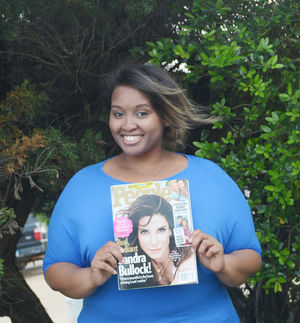 As a runner-up, Montgomery appeared in the May issue of People magazine and received a free gift from Aveeno skin care products. She says, “Beauty comes from the inside. From being happy and goofy and having a smile on your face”. Pentecom is privileged to call Erica our employee and we’re proud of the role model she is in our community. We will be showcasing employees each month so check back next month to learn about one of our other outstanding individuals working at Pentecom, LLC.